Home > Software Tutorials > How to Turn Off Auto Play in Music Player on wired headphone insertion (Android)? Android users may have faced an annoying problem of auto-play of music player when headphone is inserted to the headphone jack. The stuff becomes more irritating when you are on a call and you insert your wired headphone for talking. The music players starts playing and you are ought to miss out your conversation for sometime. This problem usually happens with PowerAmp music player in Android phones. This music player actually has a lot of customization options and one of them is auto-play of music when wired headphones are connected. This my be advantageous as it doesn’t require you to manually turn of the music. But other than this, in most of the cases this feature is extremely nagging and annoying. If you talking and in between connect the headphone, PowerAmp starts playing your songs. You have to manually turn off the music. The option can be disabled from the Settings of the app. The following tutorial will help you to turn off Auto play of Music Player on wired headphone insertion in Android. 1. 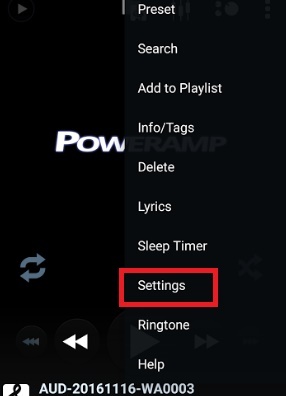 Open PowerAmp music player and go to Settings. 2. Now go to Headset/Bluetooth. 3. You will find an option called Resume on Wired Headset. The option is checked. Uncheck it. 4. The auto play is turned off.